BriForum 2009 is now less than two months away, taking place July 21-23 at the Chicago Hilton. (more info | register) We're using the exact same schedule as last year, which is fifty-six 75-minute breakout sessions spread across four breakout rooms over three days. BriForum 2009 is now less than two months away, taking place July 21-23 at the Chicago Hilton. (more info | register) We’re using the exact same schedule as last year, which is fifty-six 75-minute breakout sessions spread across four breakout rooms over three days. Just like last year, we’ll have 44 independent sessions made up of content from our call-for-papers process, and 12 sessions that are sponsored by vendors. The the sponsoring vendors are starting to really understand our audience, the sponsor sessions at BriForum are usually pretty good. But for BriForum 2009, we have several new sponsors. Over the past week or so, I've received several emails from new sponsors asking how they should best create their presentations. So rather than me emailing them in private one-by-one, I figured it would be best if the entire community told the vendors what we’d like to see in their presentations at BriForum. So here’s my first-stab at creating a best-practices rule book for vendors who sponsor BriForum. Please share your thoughts in the comments of this article, and I’ll update The List as the comments come in. Know your audience. BriForum is a technical conference. The people in the audience are technical “hands on” people. They don't need to know "why VDI." Your speaker should be “one of us.” Whoever is giving the breakout session should be someone who wants to attend as many of the other sessions as possible. So if the 55 “other” sessions sound boring to that speaker, then you have the wrong speaker. I know there is someone inside every vendor who is really excited about BriForum. Find that person and let them do your presentation. Little-to-no PowerPoint. How about this: I will create a custom shirt and wear it EVERY DAY to VMwold 2009 in August with the names and logos of every vendor from BriForum who gives a breakout session with NO POWERPOINT WHATSOEVER. Extreme demos. A lot of people think, “oh man, if my demo crashes, that will be horrible!” But not at BriForum. If your demo does not fail, that just means YOU WEREN’T PUSHING THE ENVELOPE ENOUGH! The first one goes way back to BriForum 2005 where Lakeside Software gave what was one of the best vendor sessions I’ve ever seen in my life. (Even to this day.) Lakeside Software makes server monitoring software, kind of like Citrix Resource Manager. So they had something like a 30-minute session to get the word out to the BriForum audience about their product. 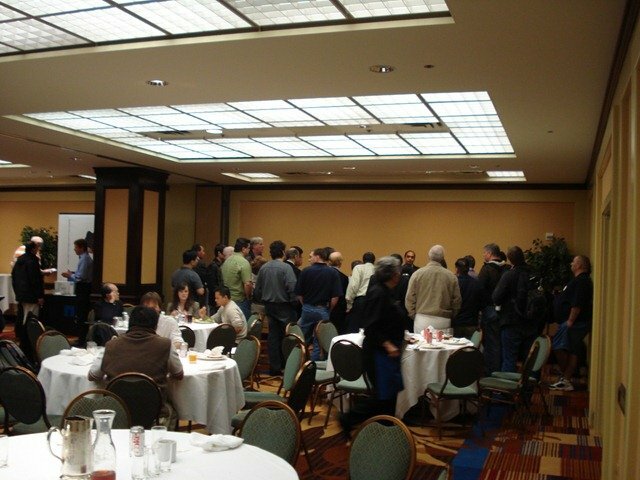 The other example is from my VDI Road Show one-day seminar that took place in San Francisco this past March. We had maybe five or six vendors there, and a few of them bought short (I think 10- or 15-minute) speaking slots in between my sessions. I’d like to call out two specific vendors: one who did it wrong, and one who did it right. First, the wrong vendor, which was NetApp. The NetApp guy just did his “standard” marketing presentation. It was a fine presentation. Not great. Not horrible. Just fine. It was obvious that the presenter didn’t really customize his presentation for this audience. He just sort of showed up and gave his standard spiel with his standard slides. And as you can expect, the audience reacted in the typical way, with most of them looking at their Blackberries or going to the bathroom. Then later at the exact same event, Atlantis Computing got up for their presentation. The Atlantis dude started off be directly addressing the audience, really engaging them and talking real world about VDI and their need and problems. He ran straight through his presentation, which was obviously created 100% for that audience on that day. Listening to him.. WOW! Not a single person was looking at their phone. Everyone in the room (myself included) was just transfixed by this guy. The funniest thing was once we got into the lunch room where various sponsors had tables. Take a look at this camera phone photo of the people standing around the Atlantis table! The irony here is that NetApp actually had a great story to tell, they just missed the boat on tying back to this specific audience. Which vendors will be at BriForum in Chicago this year? By the way, here’s the current list of vendors who will be exhibiting at BriForum. If there’s anyone you’d like to see on this list, then email them directly and tell them to sign up. ;) Seriously, I want to point out that this is the list of sponsoring vendors, not the total list of topics. This is in no way related to the content of the 44 editorial breakout sessions. Also, this list is not final. In year's past we've always had vendors signing up until that last minute, which is fine with me (as long as tune their messaging to our audience). With that, everyone, what do you think? What makes a great vendor session? What should these vendors avoid? Nice guidenlines, this should help improve the sponsor led sessions....looking fowrard to BriForum 09! Brian 'Voice of the Techies' Madden thanks for helping rid the world of marketing fluff! Great rules, looking forward to the event!